Hello! I’m Katie Wardrobe – a music technology trainer and consultant with a passion for helping music teachers. I’m a qualified teacher (but no, I don’t currently teach in a school) and I run hands-on workshops in Australia and overseas. 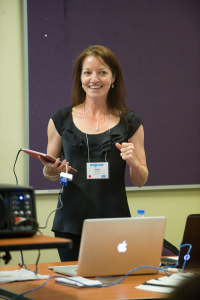 I have presented at more than 50 conferences and other music education events and in 2016 I founded the Midnight Music Community – an online music tech professional development community especially for teachers. My workshops, presentations and online training resources focus on easy ways to incorporate technology – through a range of creative projects – into what you are already doing in your music curriculum. 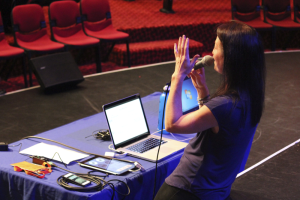 I started running music technology workshops for teachers because there was very little information specifically about how to use tech in a music education setting. Yes – you can easily read the software manual or take a general online course on the basics of a software program, but what exactly should you do with your students in the music classroom? And where were the examples for studio instrumental teachers or band directors? What sort of projects work well with GarageBand or Mixcraft, or iPads or Sibelius, and how can you ensure your IWB is used effectively in class and not just to show Youtube videos? When I didn’t find those answers readily, I set out to create my own solutions and share them through training sessions and courses. It’s very important to me that the fear-factor is taken out of using technology in education. There are no “silly” or “dumb” questions here. If you don’t know, you simply don’t know. Hopefully you might find the answer in one of my blog posts, on my Facebook page, on a Pinterest or better still, in the Midnight Music Community. I’ve been told that I explain things simply, without “tech-speak” and that I give teachers confidence to try new things with technology – even if it’s very small. Take small steps, build your confidence and then level up! What else? In 2011 I released an ebook for users of open-source software program MuseScore , titled MuseScore: The Essential Beginner’s Guide and in 2012 authored a keyboard and music technology program for middle school students titled Studio Sessions (published by MusicEDU). In 2014 I published iPad Projects for the Music Classroom (a digital collection of lesson plans with accompanying instructional videos) that focusses on the practical integration of iPads in music education. I run informal, fun hands-on sessions that offer a supportive learning environment for teachers of all skill levels. I’ve been told that I have an easy-going manner that puts even the most techno-phobic teachers at ease! I am based in Melbourne but I travel regularly to other states in Australia and overseas. Although people find it hard to believe, I really do like reading software manuals (!) and I enjoy passing that knowledge on to music teachers that don’t have the time or inclination to sit through pages of instructions. My workshops cover a range of software programs and topics, including iPads In Music Education, Interactive Whiteboards In The Music Classroom, Sibelius, GarageBand, Mixcraft, Audacity, free music technology resources, the Flipped Classroom, Digital Portfolios, Cloud-based Software solutions (perfect for Chromebooks) and more.